Diplodia ear mold at harvest: What can be done now? Diplodia Symptoms and Machinery Adjustments at Harvest. Diplodia ear mold can cause lightweight kernels with a dull grey to brownish color and sometimes small black structures call pycnidia (Figure). The infected kernels are prone to breakage and can result in poor test weights, poor grain quality and fine materials in the hopper or grain bin. Adjusting combine settings can help to maximize grain cleaning and minimize breakage. How Much is Out There? An informal survey of several grain elevators and farmers in Western Illinois had reports of less than 2 to more than 50% kernel damage from Henry to Madison County, respectively. Factors such as planting date, the timing of rain events after fertilization and hybrid susceptibility can result in a range of damage within the larger region and even within a farming operation. Dockage at the Elevator. Further conversations with elevator and ethanol facility personnel suggested that the threshold for accepting damaged grain can vary depending upon the local market and end-use. The price at which a farmer can market grain begins to decrease for every percentage point of damaged kernels above 5% and some grain elevators will set a damage threshold above which they will not accept the grain (I have heard anywhere from above 15 to 50% damage) depending upon the end use and how quickly the grain will leave the elevator. It is important for those producers that encounter Diplodia ear mold to be in communication with their crop insurance agent. While the high yields expected this year may offset lower grain prices overall, those farmers with low sale prices due to a lot of dockage may be able to recoup some of their losses. Stenocarpella maydis, the fungus that causes Diplodia ear mold, metabolizes the starches in corn kernels leaving them lighter weight than non-infected kernels. The ethanol manufacturing process uses bacteria to turn corn starch into simple sugars, eventually fermenting them to yield ethanol. Diplodia-damaged kernels can yield less ethanol and may be why elevators that supply ethanol plants may have a lower threshold (one mentioned 10%) for damaged kernels than others. One positive is that unlike Aspergillus, Fusarium or Gibberella ear molds, Diplodia ear mold is not associated with a mycotoxin. 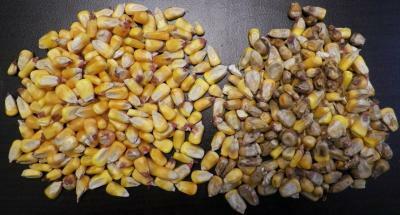 However, regardless of whether infected kernels are in the field, in the combine hopper, semi trailed or grain bin, unless the grain is cooled and dried to below 15% moisture, the fungus will continue to grow and metabolize starches, lowering test weights and grain quality. Additionally, unless properly dried, the fungus can colonize uninfected kernels that are damaged during harvest or storage operations. Drying and Storing Moldy Grain. With on-farm storage, many crop producers have the option to hold onto their grain to market it at a later time. Storing diseased grain separately and for only short periods of time is recommended to reduce the chance of additional losses. Agricultural engineers from Iowa State University have produced several tools that can help those interested in learning more about just how long air drying may take with a given fan and grain bin size and the crop moisture and air temperatures outside. For those that have the ability to add heat to the drying process, these experts have also produced tools that can help in factoring all of the costs associated with drying with or without heat. General information about Diplodia ear mold and practices to help reduce disease risk in future corn crops can be found here.